Nobody enjoyed this autumn equinox. Nobody said, „All the clouds which threatened our house are buried in the deep lap of the ocean.” It lays like a lead weight on victors and vanquished alike. For the former, the celebration of victory is struggling to drown out the voice of anxious worry, and some resounding fanfares only raise a feeble, hollow echo. And the others? Those who lost the game? They don’t know where they are going. They are aware of starving peoples behind them, starved in body and soul. Dulled and tired. Even the rage is dulled and tired. Nobody feels, „Light before me, darkness behind.“ Confusion is the mark of these post-war times. Disillusion, not recovery. And let’s admit it, we pacifists are equally disillusioned. How fiercely in recent years we desired the hour that the God of war was toppled. How our desire imagined this pivotal moment! The warriors break their swords, smash the guns, and after ages of separating people in hate, national borders lose their incredible power. The masses of soldiers make their way home, carrying the sacred and unwavering idea of a common humanity. Let’s not deceive ourselves, this moment, which Leonhard Frank called so beautifully the ‚white second‘, never happened. The end of the war was not a moment of fraternity, it was the unequivocal and unambiguous victory of the one coalition over the other. Victory, with all its consequences for victor and vanquished. The peoples, clamouring for the arms to be laid down, and demanding peace, remain in a state of agitation, excited, their natural desires, which yearn for unity, not separation, are again drowned out and misled by nationalist agitation. The result is wretched. The Chauvins in every country behave as though the future were theirs. But isn’t this impression deceptive? Isn‘t a lot of it just words and posturing, just facade, not substance? If that which the politicians preach, from the safety of their parties, really reflects the feelings of the peoples, one could abandon efforts for the community of nations for a hundred years. We love to refer to „new times,” but they are not a matter of persuasion or conviction, nor do they have real revolutionary consequences for many. For most people, it is just decoration, but we have, in fact, not yet crossed the threshold of the new times. The 9th November was not a border post, it was just one step on the way to them. We are not yet breathing God’s clean air of a new freedom, we are still living in the middle of collapse and catastrophes. What is happening around us is the closing down sale of the old order of international anarchy. A clearing up and rubbing out. And we are amazed again and again by what rubbish is revealed, and for how important the gentlemen vendors consider their bric-a-brac to be. Only now is the European decay of the time before 1914 becoming clear. Even the most stupid must now see the festering and diseased European body politic. The festering and disease which one referred to delicately as ‚territorial problems‘, and which every country strove so fearfully to hide, although the smell betrays that the veils have now been torn down. That wouldn’t be such a bad thing in itself, but it is dangerous that one still tries to solve conflicts with the same means as the old diplomacy, which has been discredited and superceded by events. The attitudes are still imperialist through and through. The proud nonsense of ‚national honour‘, with its flags and coats of arms, still sets the tone, while humanity really needs to overcome borders and help each other, if we want to avoid global catastrophe. But those who hold our fate in their hands are luxuriating in the ruins, squandering whole countries with sweeping gestures, and drawing frontiers, with an icy smile, in places that they know as well as the average European knows Red Indian territory. Is it any excuse that the losers are no better, that, instead of looking bravely into the future, people look backwards to mouldy traditions, and prefer nationalist polemics to a national purge? We are all still floundering in the labyrinth of the war. A year after the cease-fire, old Clemenceau, a man of unimpeachable democratic credentials, can still ignore all the rules of democracy and try to sell his own personal way of thinking, a strange mixture of nationalist hyper-sensitivity and an eccentric Bismarckian style, to a great, freedom-loving people, as national interest. A year after the cease-fire broad swathes of the population in Germany adhere to a ridiculous cult around the pampered prize wrestler, Ludendorff. New times? No, everyone is still floundering in the labyrinth of the war. But that just makes our pacifist endeavors more necessary than ever. It is often rightly said that the rehabilitation of Germany is the main thing at the moment, but opinions differ about how it is to be achieved. Some emphasize that only an unconditional admission of guilt can win us back the sympathy of the world, while others crown themselves with laurel wreaths, stick out their chests, covered with a variety of medals, teutonically, and only have one thing to say, “Admit nothing! Bite your tongue and keep your bearing, that’s what makes an impression!“ The third category is made up of those who mix everything nicely together in one pot, and then announce with a friendly smile that everyone was equally guilty, and we Germans only have to wait for everyone else to come to the same conclusion. However well-meaning such a point of view may be, it has no prospect of success. The mood is too much against us, and we are not in a position to indulge in further tests of patience. On the contrary, it is our highest duty to dedicate all our strength to establishing a pacifist and democratic mood in Germany. We must have the courage to try completely new methods. Such an act must be really exemplary, and above all, be able to overcome the barriers of hate and mistrust which surround us, not just a formal acknowledgement of guilt, which could easily be rejected by sceptics as mere lip-service. That is the way to a community of nations of the future, which grows out of the desire of the peoples for justice, not the schemes of statesmen. Only then will be the hour of reconciliation, and the last warrior will bury his sword under roses. 1918, the day of the abdication of the Kaiser and the declaration of the German republic. 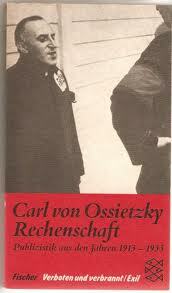 This entry was posted in 1919, Carl von Ossietzky. Bookmark the permalink.